To make the letters green they would have to be MUCH bigger.  You need the metal for the outline and then enough space to fill it with the color. I don't think there is enough space. Also, I second fixing all the typos and it would look much cleaner if the "HOME" had a solid box around it so the background didn't show through. Love the coin. Can't wait to order it. Thanks for making this happen RILMS. It looks good but the "Home" text kinda gets lost with the bronze overlay. I agree with the typo fixes NEED to be made, and then something around 'HOME' to make it look like it stands out more. Perhaps a heart shape around the word 'HOME' would be awesome if possible. Hello! 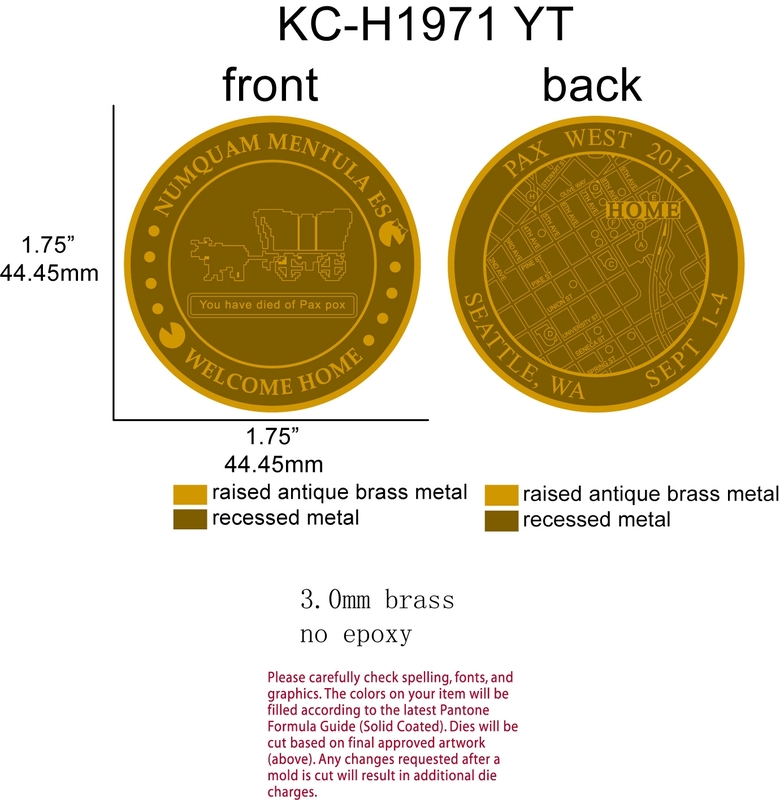 i'm new to the forums and have not been able to find any info as to where i can order a couple of these coins. Could anyone point me in the right direction please thanks!! There will be a link to a form posted when they become available for order. - Typos. The avenues are labeled "RUE" instead of "AVE". "2TH" and "3TH" on the coin should be changed to "2ND" and "3RD". Pine is "PIHE", Stewart is "STEWRRT", Olive is "OLIUE", Spring is labeled "TPRING", and Interstate 5 is missing a label. See if Kiddercorp can get em fixed! - I would do away with the circles and letters, but that's just me. With the legend in the program they serve a purpose, but I think they make the coin look a bit cluttered. Removing them could make the colored coin a bit *less* colorful, however, so maybe not. - Green pax pox text sounds like a good idea as well. And not so much another typo, but maybe tack on a period at the end there! Overall the design looks absolutely amazing! Once we have finalized the design and I have confirmed prices and shipping, I will set up the order form. I should never volunteer for things! And it needs a period at the end. "You have died of PAX pox." I've sent, "You have died of PAX pox." to Kiddercorp. I have also asked to confirm shipping and pricing. Phew! Remembered just in time to still get a coin this year! Hello all! RILMS is away for a bit, and I have returned from Edmonton. This means that I have made the Challenge Coin order form available. It is located at https://goo.gl/forms/aHAZ5jzizYSd4MPt1. I will also post this to the first post for ease of access. Thank you very much for your patience. There was talk of me distributing coins at PAX. After some discussion with Nfan10039, RILMS, and Kiddercorp, it was determined that the time frame and logistics of that would run a small, but real risk of the coins arriving in Seattle too late for me to properly distribute, so that option isn't actually available, sorry for any confusion that may have caused. The coin looks great BTW. So are the coins being shipped directly? Also, just so I make sure I'm not shorting anyone, if I want 3 color coins for domestic I'd have to pay 21 bucks correct? Wooo, I'll be ordering my pair shortly. Thanks for putting this together! Edit: The spreadsheet are the prices including shipping, right? Welcome to the order form for the PAX West 2017 Challenge Coin. For this form, you must have submitted a Paypal payment to Kiddercorp (their account is [email protected]). This is required in order to fill out the PayPal Transaction ID question. Also, in order to provide Kiddercorp with the needed funds, I have provided a payment chart located at https://docs.google.com/spreadsheets/d/1AsgJrenKv-KfCCSwpDIh94DCoxqwT2m2-Yj5VqQeR6U/edit?usp=sharing. Thank you for your patience. Look at chart at https://docs.google.com/spreadsheets/d/1AsgJrenKv-KfCCSwpDIh94DCoxqwT2m2-Yj5VqQeR6U/edit?usp=sharing to determine how much to pay Kindercorp. Go to https://goo.gl/forms/aHAZ5jzizYSd4MPt1 and state what you want and where with the money you just paid and how to look you up to make sure you didn't over/underpay. Edit: I haven't spotted a deadline and is there some kind of approximate ship date? Yay! Done. I always look forward to these and what the community comes up with. Thanks for driving this effort. Do we use the Friends & Family option or Goods & Services for PayPal? I've done Friends & Family for other things to avoid having additional fees taken out, but I wasn't sure which was preferred for this group. Kiddercorp is a company, and not your good buddy, but I've seen people do it both ways. Done and Done. Excited to see the final product! Ah, that's too bad! I'll have to pass then. I have just received word that they will not be arriving in time for PAX. For this I am truly sorry. I was hoping that the way I had laid out the time schedule would be okay, but oh well. I know better now and will account for this next year. 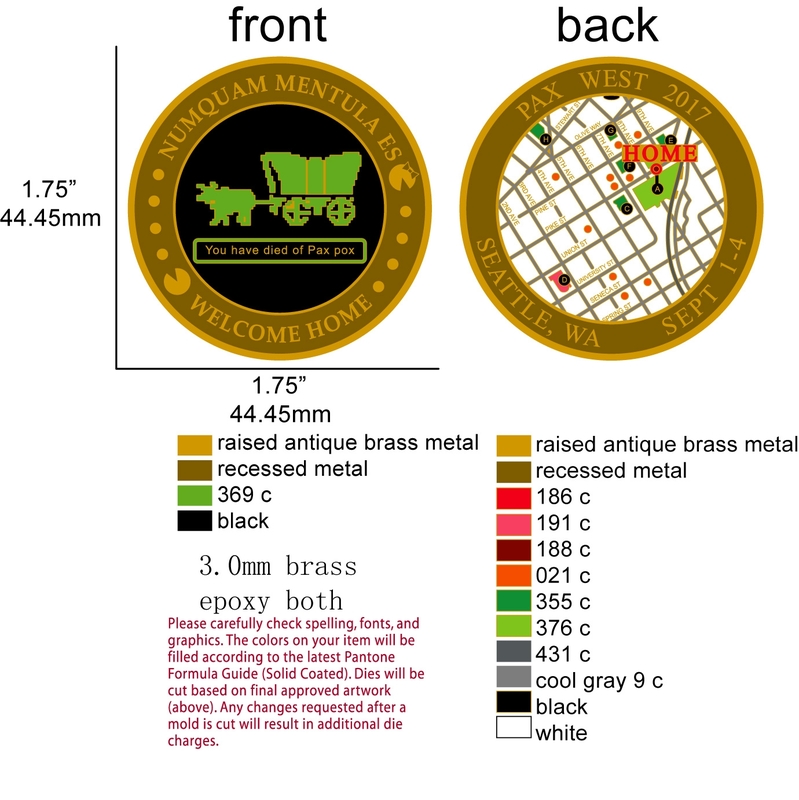 However, you can still order the coins and get them shipped to your address. Sorry for the inconvenience. Ordered one of each (regular and color)! I look forward to receiving them. Thank you for your efforts! Ordered two of each. See you all at PAX! Thanks much. The coins look great. Ordered 4 of them! Just ordered mine. Thanks again for coordinating all of this. Order placed. Thanks so much for setting this up! Ordered. Another year to add to the collection.